Is it time my piano was re-strung? Would re-stringing make a big difference to the sound of my piano? Behind these questions, it seems there's a perception of piano strings in terms of guitar strings. We know that a guitar will require many new sets of strings in its working life. But in important ways piano strings are unlike guitar strings. Guitar strings are much thinner. They get more displacement in playing. They are in contact with the natural oils and acids on the player’s fingers. All this limits their working life. A new set of strings can make a big difference to the sound and feel of the guitar. The piano is different. 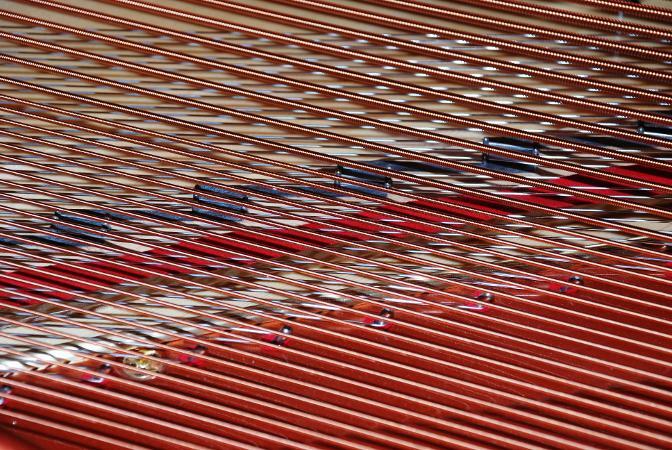 The degree of deflection of a piano string is smaller. Strings are struck by compressed wool felt instead of being plucked by finger or plectrum. They are much thicker and at much higher tension. If the tone of a piano has deteriorated, it's extremely unlikely that this is due to changes only in the strings. Piano strings should last for decades and if they are at the stage of genuinely needing replacement, it's certain that many other things will also require attention. 1) Changes in the hammers: Wear to a piano's hammers substantially changes the tone long before strings deteriorate. Techniques to reshape and voice worn hammers can make a huge difference. See the technical article on re-facing piano hammers on the Technical Info 1 page of this site, about a third of the way down the page. 2) Loss of soundboard crown and downbearing: When a piano is made, the soundboard has a curvature or “crown”. This resists the combined downward push of all the strings as they pass over the bridges, called downbearing. This system of 'springiness' - strings pushing down and soundboard pushing up - is a crucial part of a piano's tonal design. As the piano ages, the soundboard can flatten. Changes to this mechanical system affect tone very much. Other changes can happen within a soundboard too, and experienced piano rebuilders talk about "dead" soundboards. Replacement is the only answer for that, and is very costly. 3) Wear to action parts: General wear to felt, leather and cloth parts in the action gradually introduces mechanical noise and unevenness. This affects the overall impression of the piano’s tone. 4) Bridges, bearing points and terminations: Piano strings are secured at both ends, and they pass over and under bearing bars and through metal studs with holes in, called agraffes. String vibrations are connected to the soundboard by a wooden bridge with two bridge pins for each string. There can be problems with any and all of these things, and fitting new strings without addressing those problems is entirely a waste of time. So when a piano reaches the stage where strings really could do with replacement, it's certain that a great deal of other work is also needed, most of it higher-priority than the strings. Re-stringing thus tends to be carried out as part of a comprehensive restoration. This may extend as far as a complete rebuild, involving removing the cast iron plate to fit a new soundboard. Such procedures are extremely labour-intensive and therefore very costly. It is only worth carrying out all this work on pianos of the very highest quality or which have some particular historical value. Professional performance pianos such as concert grands in concert halls, and grands in recording studios or music conservatories, are a special case. Those pianos may get constant intensive playing. Such instruments are designed to take such heavy-duty use and to stand up to restringing and other procedures during their working life. A top concert grand nowadays costs over £100,000. For almost all other pianos, the strings will last as long as the rest of the instrument. When the strings really are "done", so is the rest of the piano and replacement with a new piano is probably the solution. So the ethical piano restorer is unlikely to advocate complete re-stringing as an option by itself. Check and repair soundboard cracks, rib separations (if you are not replacing the board), inspect and test rim joint. Inspect pinblock and determine if it is reusable. I will allow one restringing on the original block but not two. Scrape and refinish soundboard, replace decal (if there is one). The replacement of strings does not adequately address the issues on older pianos. A new plain wire string itself will not generally create much improvement in tone (bass strings do, of course). You notice that when you replace a broken string in the plain wire section you can't really tell any difference between the new and the old. Of course if the strings are corroded you will see an improvement in rendering and if they are heavily corroded you find some better clarity and a cleaner wave form for tuning. What does make a difference is cleaning up the terminations which includes capo bar, agraffes and bridge. If the customer doesn't want to pay you for anything other than restringing the piano, you might consider opting out of this job. I've had several people recently who wanted me to only restring the piano and I've flatly refused. Experience has told me that it's a waste of my time and a waste of their money. I service too many of these supposedly "rebuilt" pianos where many of the steps David Love listed for properly restringing a piano were skipped and the results are always less than desirable. From time to time an individual string may break. It happens on old pianos, especially if the strings are rusty at the bearing points. And sometimes it can happen on newer pianos too. The piano technician can replace the odd broken string without too much trouble. Treble strings are steel music wire, graduating in thickness from tenor section through to the top of the treble. The technician measures the thickness of the broken string using a micrometer, and selects the correct gauge of music wire to replace it. Bass strings are individually hand-made. 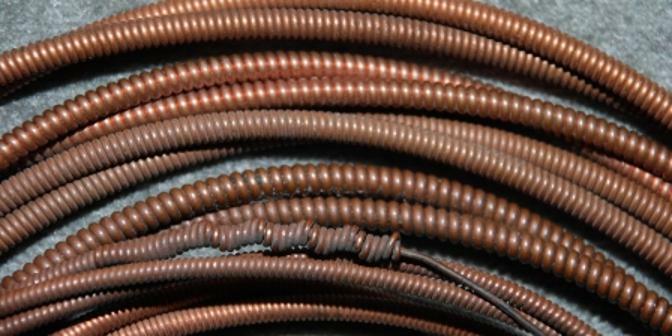 The core of steel music wire is covered with copper wire wound on to it in a very skilled process. The very lowest notes usually have a double-winding; two layers of copper. The piano technician may send the broken string off to the string-maker to get a matching replacement made, or various measurements can be taken to give the string-maker the correct specification. We've made the case pretty strongly here that complete re-stringing is not a job that by itself will make much difference to a worn piano. However, it can be worth replacing just the bass strings in certain circumstances. Bass strings are structurally complex, because they are plain steel music wire with copper windings covering them. Problems can develop that make bass strings 'buzz' because the copper windings have loosened. Or spillages of liquid into the copper windings can deaden the sound drastically. Or perhaps they were not a great set to begin with, and have deteriorated. A new set of bass strings in these circumstances can make a big improvement. BUT, the technician needs to be sure that the problem is really with the strings themselves, and not the bass bridge or the soundboard. That takes expert appraisal. When I require replacement bass strings I get them made by John Delacour, a very experienced piano builder and string maker. There are excellent technical articles on John's website, very well illustrated with clear photographs, covering a number of different aspects of piano repair. And if you are mathematically inclined, and interested to find out more about how piano string scales are calculated, John has an article on that too.